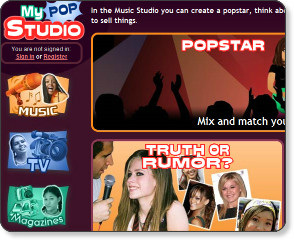 Geared to tween girls, MYPOPSTUDIO.COM engages girls in the mass media and entertainment industry decision-making process. They can create their own animated pop star in the site's "Music Studio" and make decisions about what she wears, her hair style, body shape, and makeup, and the lyrics, instrumentation, and beat of the song she sings. Kids can also edit a TV program and compose a scene in the site's "TV Studio," design a multi-page magazine spread in the "Magazine Studio," and test their multitasking abilities in the "Digital Studio." The site also provides a link to downloadable lesson plans for parents to use in informal, home-based learning and for teachers to introduce in classrooms. Projeqt describes itself as "dynamic presentations for a real time world." Use it to create linear and stacked slide presentations for any type of event. Embed images, text, documents, or add data from your favorite social media tools. Tip: Use in your library to create a stacked slide show to feature books by genre. Gamestar Mechanic is an interactive site that leads users through the game design experience. This site teaches the principals of game design and systems thinking in a highly engaging environment that allows users to share games with other community members. Tip: Use as part of a STEM initiative, Gamestar Mechanic has a teacher's page with useful lesson plans. Do more than watch a video: discuss, question, and comment. Vialogues puts the “think and do” into video watching. Vialogues allows you to post a video and then invite participants to answer questions, discuss or just comment. This asynchronous tool can be used for private or public interactions. Tip: Use this tool with media literacy lessons. Popplet delivers an interactive way to create concept maps, mind maps, and options to brainstorm or storyboard right along with peers. The “popplets” can be constructed, moved, color coded, typed in, drawn in, and have images or videos inserted. Popplet is a nice addition to the teacher toolbox that can meet a variety of needs, including concept mapping, collaboration, and even presenting content. TIP: Have students make a genre presentation by taking a series of books and working collaboratively to make various connections to booktrailers, images, and more. Tell stories with graphics, text, and audio with this visually compelling application on desktops, iPads and iPhones. Network socially without sidebars, ads, or logos in this online environment that focuses on the content you create with photos, video, and slideshows.Tip: Use this tool to share daily life in your dynamic library with the school community using video, photos, and text. Teach students and colleagues to collaborate as integral partners in the digital evolution as they discover and share content to use, re-purpose and remix with Creative Commons. Here you will find all the resources needed to learn appropriate use of Creative Commons licensing for written, graphic and multimedia content.